Our Electrical Lineworker Program (ELP) is designed to the skills necessary for a career in the electrical line work industry. We use training methods that have proven to be extremely effective in preparing students to be highly successful employees. During the 15-week program, students will be trained in three educational areas: Academic Training, Field Training as well as Certifications & Skills. Student/Teacher ratios during the field training environment are 16:1. SLTC’s extensive training programs spread across the globe and reach the highest expectations of the overhead transmission industry. Our programs range from entry-level climbing and bucket truck operations to more advanced live-line procedures and industry standards refresher and update training. 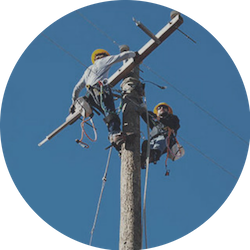 We also offer a wide variety of consulting services including lineman assessments and safety program analysis and development. 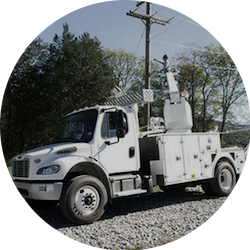 Communications Lineworkers are the industry professionals responsible for keeping us connected. SLTC Communications Lineworker Program is the first of it’s kind, but it’s built on the foundation of our training methods and practices developed with our professional team of instructors and industry partners over the past 16 years. When you complete the program you’ll be prepared to enter into a career with great pay, great benefits and a great future. Your journey starts right now. Working with underground utilities and residential settings can be full of challenging scenarios. Our staff is equipped to train in the most up-to- date industry standards to help your company succeed. Our comprehensive overhead distribution programs are sure to meet your company’s needs. 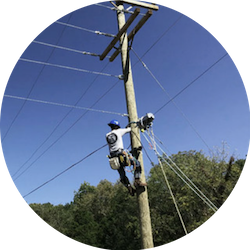 Whether it’s entry-level training such as wood pole climbing and rigging fundamentals, advanced training such as live-line procedures continuing education programs, or consulting services such as lineman assessments and safety program analysis, SLTC has you covered in all aspects of the industry. With the expansion of fiber optic networks and the need for people to stay connected, we are equipped to train your staff and/or applicants in the most recent telecommunications linework standards and procedures. are you looking for more specialized training? A sample of our on and off-site labs available each calendar year. 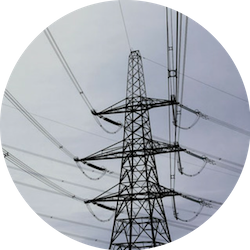 The focus of basic electricity is to help the student understand how electricity is produced, manipulated, and used in an electrical system. AC and DC circuit work will be performed using Ohm’s laws. The main objective of the circuit work is to prepare the student for similar circuit work that will be encountered in future electricity courses. Success in this class will usually indicate that a student will find few problems with the academic portion of an apprenticeship program. The rigging class will cover ropes, knots, splices, slings, and chains that are commonly used in rigging operations. Students will learn to calculate tensions and safe working loads for various rigging applications they may encounter within the industry. Additionally, the course will provide an understanding of load charts as they apply to digger derrick and bucket trucks commonly used within the electrical utility industry. 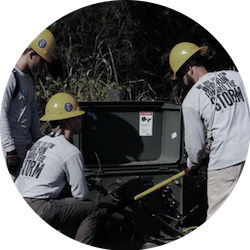 Many linemen work with transformers more often than any other piece of pole line equipment because every customer has to have a transformer to receive service voltage. Thus, this course will explain the importance of transformers within the electrical system. Students will learn the theory of how transformers work, their anatomy, and how to connect, parallel, and bank them to supply the desired voltage. Climbing skills are developed over the duration of the lab, from day one until graduation day. 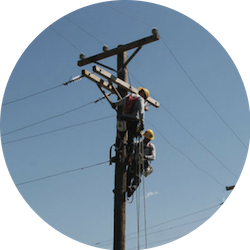 Students will learn the fundamental techniques used for climbing wooden utility poles and will be taught how to inspect, maintain, and use that gear to climb up, down, and around. Climbing skills are developed over the duration of the lab for maneuvering and working on wooden poles, installing and removing hardware, and pole top rescue. (This course requires an attendant to have completed Climbing 1 or have proven they have the ability to complete the skills taught in Climbing 1. This course provides a basic understanding of digger derrick trucks as associated with electrical line work. The classroom portion of the course includes online qualification training for digger derrick trucks. The online portion includes things such as truck set up, truck inspection, hand signals, and basic operations. All students will conduct hands-on operations of digger derrick trucks. In this course, a student will learn about rubber protective equipment that is used when working on distribution lines and will demonstrate how it is used. Describe and demonstrate how to inspect rubber protective gear and how to install and remove rubber protective gear in a variety of job situations. They will learn work plan development, execution, and live line gloving jobs. Hazard recognition is a key element within this training as well as the maintaining of insulation and isolation at all times. Students will learn to make primary splices and primary terminations. They will also learn switching and tagging, cable isolation, grounding, and fault locating. Students will learn to operate the crane, use of load charts, and understanding of rigging required in crane operations. Multiple crane size certifications offered. © 2019. Southeast Lineman Training Center.